Note: The following represents some of the persecution Christians experienced at the hands of Muslims during the month of April, 2015 alone. After reading this, ask yourself how Western media, politicians, and other talking heads would react if Muslims experienced the same sort and amount of persecution at the hands of Christians or in Western nations in just one month. 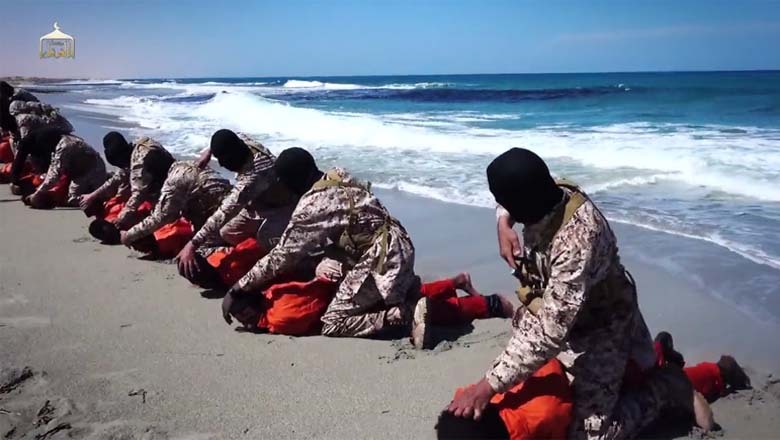 One group of Christians were shot execution style to the back of their heads, the others had their heads carved off, like the Copts before them. We say to Christians everywhere, the Islamic State will expand, with Allah’s permission. And it will reach you even if you are in fortified strongholds. So whoever enters Islam will have security, and whoever accepts the Dhimmah contract [subjugated, third-class treatment and social status] will have security. But whoever refuses will see nothing from us but the edge of a spear. The men will be killed and the children will be enslaved, and their wealth will be taken as booty. This is the judgment of Allah and His Messenger. On April 2 in Kenya, gunmen from the Somali Islamic group, Al Shabaab—“the [Islamic] youth”—stormed Garissa University, singled out Christian students, and murdered them, some beheaded. A total of 147 people were killed in the attack—making this jihad more spectacular than the 2013 Al Shabaab attack on the Nairobi mall, which left 67 people dead (then, Islamic gunmen also singled out Christians for slaughter). Al Shabaab has a long history of singling Christians out from among Muslims for slaughter (here are four examples). Other jihadi groups—including Boko Haram and the Islamic State—also make it a point to distinguish between Christians and Muslims before slaughtering the former, a fact often omitted from “mainstream media” reports. On Sunday, April 5, as Coptic Christians were celebrating Palm Sunday, a church was attacked in Alexandria, Egypt. Gunmen in a vehicle opened fire on the church during the night injuring a police officer and two civilians. On April 12, Easter Sunday according to the Orthodox calendar, two explosions targeting churches took place in Zagazig vicinity. One car explosion took place near a Coptic Orthodox church and another bomb exploded near the Evangelical Church in the same area. Although no casualties were reported, large numbers could have easily resulted, based on precedent. For example, on January 1, 2011, as Egypt’s Christians ushered in the New Year, car bombs went off near the Two Saints Church in Alexandria, resulting in 23 dead worshippers and dozens critically injured. After waiting for 44 years, the Christians of Nag Shenouda, in Sohag City, finally got the necessary permit to build a new church. Muslims again rioted and even burned down the tent the Christians had erected to worship under. Denied, the Christians of Nag Shenouda celebrated Easter in the street (picture here). And when one of them tried to hold worship service in his home, he and his household were attacked by a Muslim mob. On Easter Sunday, the Islamic State destroyed the Virgin Mary Church in Tel Nasri, northeast Syria. The Assyrian church was built and consecrated in 1934. Loosely translated as “Christian Hill,” Tel Nasri is an ancient Assyrian Christian village. It is one of the dozens of Christian villages along the Khabur river that were attacked and occupied by the Islamic State in late February (more here and here). On April 28, the St. Odisho Assyrian Church in Tel Tal and the St. Rita Tilel Armenian Church in Aleppo, were also destroyed. The church and all the properties were burnt down in the presence of the Christian community despite all pleadings for them to stop the destruction. The arsonists gathered cornstalks and put them inside the church in order to cause greater damage…. We have the right to belong to any religion of our choice and live anywhere in this country. We call on the authorities at all levels to rise up to their responsibilities of protecting lives and properties of every citizen in this country. Pakistan: Two assailants on motorbikes opened fire on the main gates of a church and Christian school in Lahore. The school had just closed half an hour earlier and several students were present outdoors. Police were present, causing the attackers to ride off. Two passersby were injured in the crossfire. Egypt: A Muslim man stabbed a Christian woman with a knife multiple times and then threw her body into a canal. The Coptic woman, Gamila Basilious, was 48-years-old and married, living in Minya. According to police reports, the man, Mahmoud Hassan Abdulhamid, came to her door inquiring about her husband. When he discovered her husband was not present, he took advantage of the situation by attacking her with a knife, with repeated stab wounds found on her neck and chest region. As “infidels,” Coptic Christians are regularly attacked in Egypt, including kidnapping, church attacks, and just random slaughter. The five Muslims took hold of me, and they raped me there. I tried to scream, but they threatened to kill me. One of them said, “Your father should stop this prayer meeting of trying to change Muslims to become Christians and close the church building—we have warned him several times. Bangladesh: A Muslim mob attacked a former Muslim and his wife for converting to Christianity. The couple was attacked as they were returning home after being baptized. The man was slapped across the face by a Muslim imam in front of his two young children. The Islamic mob further broke the fence of the new Christians’ family home and said they would chase the “apostates” out of the village for leaving Islam. The man who baptized the couple was also attacked and beat by the mob at his home and later lost his job. Ethiopia: Gemechu Jorgo and Sheikh Amin—two men who were distributing Bibles in Ethiopia’s Melka Belo region—were arrested. Islamic law bans the advertisement and dissemination of any religion other than Islam. While imprisoned, both men endured harassment and physical abuse by authorities. At one point, Jorgo reminded District Administrator Jamal Adam of his constitutional right to practice his Christian faith freely. In response, the Muslim administrator used Jorgo’s Bible to slap him in the face three times. Amin, formerly a Muslim sheikh and prayer leader of a mosque, is a recent convert to Christianity. While in prison, officials persistently pressured the apostate to renounce Christ and return to Islam. He refused. Both men were eventually released. Ethiopia is a Christian-majority nation, though Muslims make for 33%, or one-third of the population. Uzbekistan: Reports appearing in April told of the harassing, jailing and fining of several Christians for exercising their right to freedom of religion or belief. One of the prisoners of conscience—Council of Churches Baptist Doniyor Akhmedov—was fined more than three years’ official minimum wage after his release from 15 days in jail. Other prisoners of conscience to be jailed for short periods include a Protestant in Bukhara, who received seven days’ imprisonment for “illegal” religious activity and another Protestant who received 10 days’ jail time for “teaching religion illegally.” Their identities remain anonymous due to fears they might suffer more reprisals. Nine more Protestants were fined for “illegally storing” Christian literature and materials. Their homes were raided earlier by police who confiscated various Christian books and CDs and DVDs. “Religious minorities face tight scrutiny in Uzbekistan as they are unable to openly practice their beliefs without facing major penalties such as jail terms or heavy fines,” reports Forum 18 News. Iraq: Right around the same time the “mentally unbalanced” Muslim man was destroying Christian crosses and tombstones in France, the Islamic State published pictures of its members destroying Christian tombstones and crosses in cemeteries under its jurisdiction—including Mosul’s oldest Christian cemetery near the Syrian Orthodox Cathedral—and quoted Islamic scriptures justifying its actions. Several jihadi websites posted these pictures. Some include Islamic State members using sledgehammers to destroy gravestones and efface the crosses carved on them. On April 1, Islamic militants shot and wounded the brother of Sardar Mushtaq Gill, a prominent Christian rights official in Pakistan. This is the latest attack on Gill and his family by Islamic militants angered at him for criticizing the controversial blasphemy laws that are routinely used to attack Pakistan’s Christian minority. The attack occurred in the Kasur District of Punjab province. According to the human rights official, “Pervaiz Gill [his brother] suffered a bullet wound to his lower back, and was rushed to Jinah Hospital in Lahore [city] where it was removed.” However, “the police is not arresting the shooter” who was publicly identified as Muhammad Bilal: “Our life remains under threat if the shooter is not arrested.” Last August, Gill’s home was sprayed with bullets in the night, for the second time. In these days how many Stephens there are in the world! Let us think of our brothers whose throats were slit on the beach in Libya [by the Islamic State]; let’s think of the young boy who was burnt alive by his [see above]; let us think of those migrants thrown from their boat into the open sea by other migrants because they were Christians [see above]; let us think—just the day before yesterday—of those Ethiopians assassinated because they were Christians [see above]… and of many others. Many others of whom we do not even know and who are suffering in jails because they are Christians… The Church today is a Church of martyrs: they suffer, they give their lives and we receive the blessing of God for their witness. I regularly get reports of horrible crimes that are committed there against Christians, especially in northern Iraq. I have visited those places and I remember that there were many churches and monasteries there. The city of Mosul alone had 45 churches. Now there is not a single one. The buildings have been destroyed. Four hundred churches have been destroyed in Syria… Now Christianity is the most persecuted religion. The same is happening in Nigeria, Pakistan, and Northern Africa. First, what happened is that, when we make a decision for the church but then cannot implement this decision [to build the church] because some of the Muslims do not want it, because they don’t want the church—this is, first and foremost, a failure of the state and its authority and a failure of the rule of law. When a group comes to oppose [with violence, several Copts were injured], and the police leaves them free, this is like a disease that will spread everywhere. Today, for example, there is a decision, but there are say 3-4 Brotherhood or Salafis opposing it, and the government appears protesting with them—in this case, you have given everyone who wants to oppose [with violence] the opportunity to oppose. The survivors said they had boarded a rubber boat April 14 on the Libyan coast with 105 passengers aboard, part of the wave of migrants taking advantage of calm seas and warm weather to make the risky crossing from Libya, where most smuggling operations originate. During the crossing, the migrants from Nigeria and Ghana — believed to be Christians — were threatened with being abandoned at sea by some 15 other passengers from the Ivory Coast, Senegal, Mali and Guinea Bissau. They were pelting Christian homes with stones, pounding threateningly on doors and windows, attacking shops owned by Coptic Christians. They destroyed the door of my shop and they destroyed a photo studio owned by the father of one of the boys. For three days we were living in terror and panic. We stayed in our homes and our children didn’t go to their schools. We also couldn’t go to church to attend the masses for [Coptic] Holy Week. On Thursday evening (9 April), the Muslim demonstrators attacked our home. They pelted it with stones and insulted us. They were shouting, “Oh kafirs (infidels), we can’t let you live here. We will oust you from our village.” They also stole the windows from our home…. We were unable to go to the church during these events. Also, we didn’t go to the church on Saturday to attend the Easter mass. Until now, we have been staying at our homes and are afraid that the attacks against us will be renewed.